Climate change created the situation whereby the forest areas deceased and the savannah increased opening up the opportunity for hominine ancestors to venture out of the forests into the savannah. With this new environment, considerable opportunities were brought about and this space was filled as space is always filled with living plants and animals. The new environment brought about change but there was no direction in the change. The result was bipedalism. Walking and running was not the aim of bipedalism but a fortunate spin off. Running is just so natural to us when you consider how children run almost as soon as they can walk. Once bipeds evolved they were able to move even farther, eventually occupying the habitable earth. Legs became very efficient enabling Homo erectus to travel large distances walking and running, perfectly ‘designed’ for the purpose. 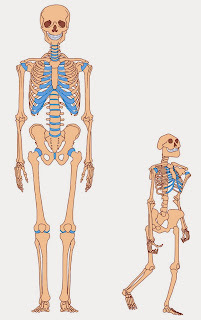 Bipedalism gave birth to increased head and brain size. Large heavy heads could develop on an upright body which would have been to heavy to be carried horizontally. Homo erectus over millennia ventured around Africa and Eurasia with variations on a theme, but it was in Africa that the they gave rise to Homo sapiens that spread throughout Africa with considerable variation. Eventually however a population of north-east Africans branched off 100000 years ago from the main sub-Sahara African population of Homo sapiens and later another branch populated Eurasia. The environment in Eurasia may not have favoured long legged 'athletes’ like north-east Africans, however it may be that after the split from the population that left Africa, the running ability of the north-east African population continued to evolve favouring their athleticism while those in Eurasia did not for a variety of reasons, mainly the different environment, including the cold climate and perhaps the admixture of Neanderthal genes. With recent genome analysis of Neanderthals up to four percent of Eurasian genes are from this source. Neanderthals have been depicted as being short and squat and they may have passed on ’leg genes’ to Homo sapiens in Europe and Asia. It is also claimed that the cold weather caused legs to become shorter but that does not account for normal legs of Scandinavians and Chinese. Eurasians have for the past 10000 years relied less and less on legs for their existence. The agricultural revolution made hunter-gatherers redundant, and allowed for a vastly increased population. With a greater population there is an increased chance of mutations and of course a greater chance of beneficial mutations being passed on to future generations. Other ways in which mutations that are not beneficial or greatly disadvantageous can be passed on is by genetic drift. If mutations that change the geometry of the leg structure have no adverse effect because the agricultural environment has no need of running bipeds, they could be passed on from generation to generation. In a hunter-gatherer populations these mutations would be deleterious. The north-east populations of Africa were able to retain their efficient bipedalism. Hunter gathers like the San and other sub Saharan African all had well proportioned legs. If they had not they would have succumbed in one way or another and not passed on ‘poor leg genes.’ In long distance athletic events in South Africa the first ten places are almost all filled by Africans, even though a greater number of Europeans and Asians take part. Africans of West African decent dominate athletic sprint events without fail. 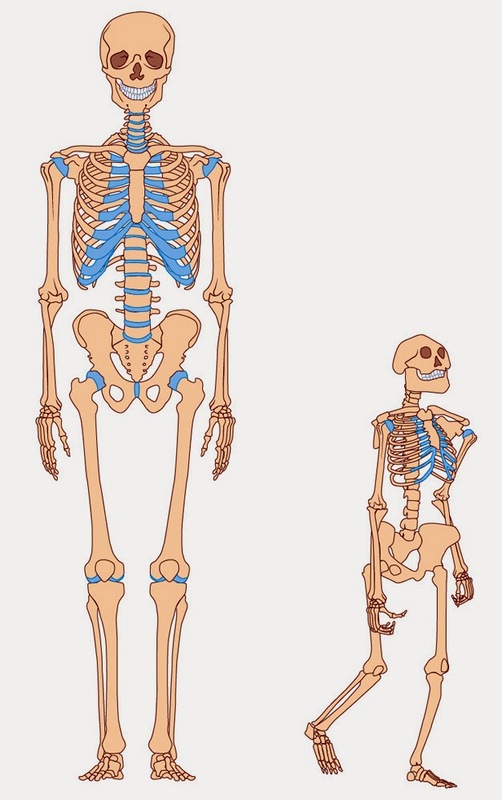 This can be put down to the fact that either Eurasian legs degenerated over the past 100000 years or did not evolve further and are not as efficient as longer African legs. Japanese tend to have shorter lower limbs that are bowed while European legs come in all sorts and sizes which causes many injuries in long distance athletes. Runners with well constructed legs that are gifted runners seldom suffer injuries. The Tarahumara Indians of Mexico supposedly never get injured though they don‘t match the North East Africans. Those that have been unfortunate to inherit legs of different lengths, poorly constructed feet, and bowed legs, faults of which only a few are mentioned here, will suffer injuries. Over-pronation and high arch ‘clunk’ feet, cause a multitude of problems for runners. These faulty biomechanical factors such as different leg length bowed legs and lateral pelvic tilt can cause ilitotibial band friction syndrome and runners knee amongst other injuries. These inherited deformities will be passed on with increased frequency, and concentrated in the non athletic population. In the perfect running stride the knees will pass each other with barely a millimetre between and if foot marks are left on a sandy beach, a line can be drawn that will be parallel to the inside of the heel and big toe of each foot with only the width of the line in between them* Runners with abnormalities are unable to run like this and have to train less to avoid injuries, which means poorer performance. However these badly constructed legs can perform very efficiently in sports like cycling. Most good athletes can cycle well but not all cyclists can run well. Japan has the fourth largest rugby playing population in the world with 125000 players yet languish at the bottom of world cup competitions. They are keen participants in triathlons but are seldom seen amongst the winners while for a country with such a large population they do not make their presence felt in long distance running. Considering the poor conditions and other adverse conditions in the African countries their athletes perform exceptionally well. Africans with Kenyan and Ethiopian ancestry hold all world records from 3000 to marathon distance records while Africans with West African ancestry hold all records up to 400 metres. In all other sports where legs are not as important, Eurasian athletes competes just as well.
. Athletes and non athletes. The change to a situation whereby bipedalism was not so important began with the agricultural revolution but perhaps increased more rapidly with the industrial revolution, though it is difficult to pinpoint that exactly. But up till recently in evolutionary terms humans needed their legs to get themselves around or they were in trouble. Now legs have become less and less important with mass transport, motor vehicles, and escalators moving people around without the necessity to walk any distance. Once at the work place there is little moving around. With the ever increasing population in densely populated cities, there is very little opportunity for people to run any distance and those that do, form a very small part of the total population. This is a relatively new phenomenon. There are also implications such as obesity, exacerbating the situation. However there is another side to the coin. Sport has in the last 125 years become an increasingly important cultural phenomenon in which only the gifted and motivated really take part and are just a minority in heavily populated areas, while most of the population are just fans or followers. Future generations may well be divided into athletes who pass on their genes to athletic children. Male athletes will produce children with women with well shaped legs. This will be sexual selection or they will produce children with female athletes. It is noticeable that female athletes whether in sports like skiing as seen in the Sochi Olympics or in other athletic sports all have well shaped legs. It is not just beauty in the eye of the beholder . Efficient legs are beautiful and beautiful legs are efficient. Well shaped legs going back in time to Greek statues are the same as what we consider perfect legs 2500 years on. Sport and particularly athletic sports as we know them today are a relatively new phenomenon and in only recent years have sports people been raised up to such heights of popularity There will be gene flow between athletes and non athletes, but it will result in a gradual sorting out. A huge population of non athletes will still be able to carry on normal lives but they will just not be able to participate in athletic sports effectively because genetic mutations will be passed on by genetic drift and not be removed by natural selection. The genes have been discussed earlier that cause deformed legs and running injuries. It will happen quite quickly in evolutionary terms and will be very noticeable in a few hundred years or so. Long term prognosis is impossible to forecast as there are too many variables to consider but all things being equal this is the scenario. The African population that lagged behind in the agricultural revolution and remained hunter gathers up till much more recently may well follow the same trend. Notes This is partly inspired by Charles Murray’s ‘Coming Apart’ where he describes, new upper class (the rich and famous and elite) diverge from the new lower class. As an athlete, much of this essay is from personal observations especially leg geometry and the perfect stride*, including running injuries, though I referenced the Internet for some details and Tim Noakes ‘The Lore of Running’ on running injuries.